We can all agree that no-shows are the worst. Not only is there the hassle of following up and rescheduling, there’s also the bummer of having an open slot where you could have brought in sales, but didn’t. That’s why we have automatic appointment reminders (text and email) built into Square Appointments — so you can cut down on all the phone time you’re probably spending reminding people of their upcoming appointments. Reducing no-shows is one thing. But if you’re a busy salon, managing your day-to-day schedule is also a lot to handle. Things happen — maybe you’re running a few minutes late, or maybe you need to cancel because of a last-minute emergency. Either way, you’ll need to let your clients know. Now Square Appointments makes this easy. With our new client notifications feature, you can send personalized appointment reminders to your clients conveying specific information about their upcoming appointment. If you need to change an appointment, you can select how you want to notify people — whether it’s via text or email. And you can personalize the email to say what you want—so the communication with your client is personal. You can also style your appointment reminder emails with your branding. The appointment reminder template now includes your business logo and information at the top (in the style and colors you selected in your Public Profile), so the message looks like it’s coming from your business, rather than an automated system. You can add a personal message to the client, too. Which always goes a long way. So you can say something like “So sorry, running 20 minutes late, but we have wine — and Us Weekly!” rather than a stiff “Your appointment has been canceled” message. We understand that every client interaction is a direct extension of your brand — so you should be able to customize your message in a way that fits your personality. Cutting down on no-shows through appointment reminders and streamlining communication with your clients with custom notifications will help you focus on what matters most — running your business and your relationships with your clients. Square Appointments is rated one of the most popular, user-friendly, and affordable software products for salons by Capterra. 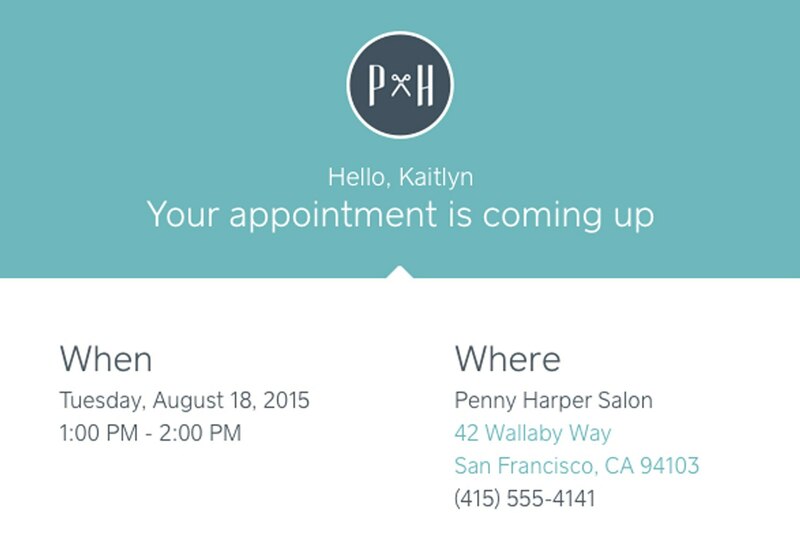 Try Square Appointments and see for yourself.